Why do I need a magnetic filter? A lot of central heating systems can suffer from severe contamination with black iron oxide. Iron oxide is formed as a result of corrosion of steel radiators and other metallic components within the heating system. It takes time for this process to happen but hard water can increase the rate of corrosion. The black iron oxide, also known as magnetite, bonds with other corroded debris in the system to form thick sludge deposits. These particles stick to internal components, causing damage and premature failure of pumps and valves. If the boiler heat exchanger and pipework are affected, the heating system starts to lose efficiency. Over time the loss of efficiency can be dramatic. Tests have shown that even a minimal build up can result in a substantial drop in the efficiency of the boiler. 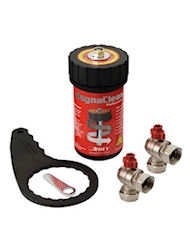 We install MagnaClean, Sentinel and Ferox magnetite filters for domestic and commercial heating systems.